April 24, 2007: Cloudy and warm, Water temp 65* and covered in pollen. Met clients at 5:30 and went a short distance and set up on a 10' flat pulling boards. 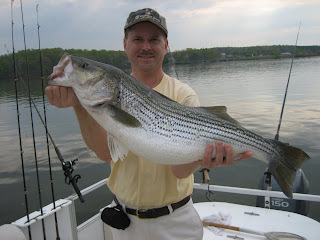 The fish were finicky at first but once it got good and light out the Stripers started jamming the baits well. We made 3 or 4 passes on the flat before the action slowed and then I pulled off into 25' of water and found the fish again. To my surprise the Stripers stayed in the upper water column and bit well on boards. We had a fish blow up on the bobber and after a long battle Ken got the fish to the boat which weighed 14.5 pounds. 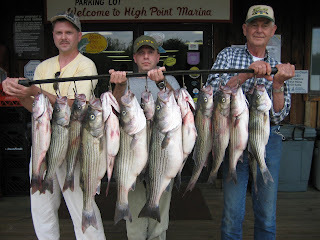 We continued to fish the deeper sections with boards and by 11am we had caught 17 Stripers. Clients kept 15 very nice Stripers that went well over 100 pounds.